Using pre-defined InLoox text elements for your e-mails speeds up your project communication. InLoox e-mail templates provide pre-defined and project-related information for different e-mails. 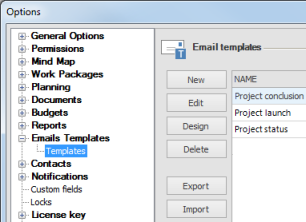 You can add new e-mail templates as well as modify the default templates in the InLoox options. Click on Email Templates on the Message tab. Select an e-mail template from the dropwdown-list. The text template will be added to your email. In the template defined recipients will be inserted. Now you can edit recipients or the e-mail content. When you have finished click on Send. InLoox email templates • Copyright 1999-2019 © InLoox, Inc. All rights reserved.